How Much Does A Car Clutch Replacement Cost? If you hit problems with your vehicle’s clutch, you’re likely to get a big sinking feeling, because you know you’re about to take a big hit in your pocket by needing a clutch replacement. This is why its important to know the clutch replacement cost for your car and knowing where to get it replaced as this is a large factor on knowing how much to replace your clutch. You usually get some warning that your clutch is about to fail. The key to recognising this is realising the importance of the concept of the clutch’s ‘biting point’. When you press your foot on your clutch pedal, this causes one of the two circular plates which comprise your clutch to separate. These plates act to disengage the engine from the vehicle’s wheels, and this allows you to change gear without those horrible grinding and clunking sounds which you get if the engine and the wheels remain in contact. As a clutch mechanism wears - just as every part of your car does with regular use - you will find that the ‘biting point’ becomes lower and lower along the clutch’s line of travel. This means that the pedal is losing its ability to operate the mechanism which separates the moving and the static parts of your clutch system. How Do You Know When You Need A Clutch Replacement? The basic components of a clutch are the flywheel, clutch disc, pressure plate, throw-out bearing and linkage. A hydraulic clutch uses some additional components including a clutch slave and master cylinder - the vessels which contain the fluid which operates the clutch when the pedal is pressed. Confusing right? That's why the clutch replacement price can be high if using the wrong service. The flywheel is bolted to the crankshaft of the engine, it has teeth around the outer edge and is used in conjunction with the starter motor to turn the engine over when you first start it up. The flywheel also acts as the balancer for the engine, dampening vibrations caused from the engine firing, and providing a smoothly machined friction surface for the clutch to come into contact with. The clutch disc is a steel plate covered in a friction material similar to that which provides the contact between your brake pads and the metal of the brake disc. In the centre of the disc is a hub that fits over the splined input shaft of the transmission. When the clutch is engaged, the disc is ‘squeezed’ between the flywheel and the pressure plate, and the power from the engine is transmitted through the hub onto the input shaft of transmission. If your clutch pedal is fading and feels unusual in any way when you operate it, again the vehicle should be checked out. A failing clutch, whether it is the hard parts, the linkage or the hydraulics can cause you to break down while driving. Having the operation of your clutch regularly inspected and any leaks of the hydraulic system repaired on discovery will help to keep you and your vehicle safe. How Much Will It Cost… How Long’s A Piece Of String? Because a clutch failure can involve an isolated component or the whole system, a clutch replacement cost can vary widely. And in many cases, because a clutch is considered a ‘wear and tear’ item, its replacement will not be covered by any remaining manufacturer’s or other warranty on the vehicle. This is simply because vehicles are driven in widely varying traffic conditions, which mean that the clutch gets massively differing levels of use from one vehicle to the next - so no manufacturer or warranty company would be prepared to offer blanket coverage under their terms. 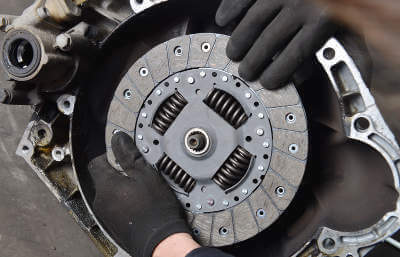 Under normal driving conditions, a clutch can reasonably be expected to last seven to 10 years - but it is the need to replace the whole mechanism, often along with some other allied parts, which increase the clutch installation cost. For many vehicles, it’s possible to buy all the parts needed to replace a complete clutch mechanism in a kit form, which can help reduce the cost if the clutch is deemed a total failure. However, it’s the fact that significant dismantling work is needed to allow the mechanic to access the clutch kit which means that labour costs commonly exceed those of the parts involved. Because of this, motoring advice and help organisation Motoring Assist says, before going ahead and getting a complete replacement clutch system, you should always check whether the symptoms of the problem aren’t caused by the operating mechanism, rather than the clutch itself. One thing to be aware of when you get a clutch replacement quote is the possibility that, if your car has what’s called a dual mass flywheel clutch, you may get a higher estimate. Since 2002, these mechanisms have been fitted to all four-cylinder diesel cars with manual, DSG and ESG gearboxes. Some estimates suggest that about half of cars on the UK’s roads these days have this type of clutch, which has been used by a long list of manufacturers, including big boys such as Audi, BMW and Volvo. A dual mass flywheel consists of two main parts, one attached to the engine, and the other to the clutch, both linked by a system of springs and friction pads. Their job is to absorb vibration from the engine and provide a smoother delivery of power to the transmission. As well as reducing wear on the gearbox and other engine parts, this also helps give a smoother ride for a vehicle’s occupants. They became more common in conjunction with diesel engines as the power produced by such engines increased, and so manufacturers felt there was a greater need to ensure that this power didn’t mean occupants got a rougher ride. Dual mass flywheels are subject to a range of problems, including wear of the friction pads and rattling springs when starting or stopping the engine; a shuddering when being driven at low revs while a vehicle is heavily loaded; a difficulty in selecting gears when the engine is running; overheating caused by a slipping clutch; and possibly clunking from around the gearbox. One crumb of comfort applies to owners of diesel-powered cars with an automatic gearbox. These don’t have a dual mass flywheel, as the torque convertor - the system which automatically adjusts which gear is selected as the car is being driven - helps to mitigate the vibrations and stress placed on the vehicle when a different gear is being selected. What Does Replacing A Clutch Involve? The high labour charge for repairing clutch faults is accounted for by the fact that the operation often also requires the vehicle’s gearbox to be removed first. 1. The car must be parked on a level, solid surface with the handbrake engaged. 2. The next stages must all be carried out in a methodical, prescribed order, while some specialist tools are also involved, particularly to ensure that the replacement clutch is correctly aligned - this will cause premature wear, and possibly even mean the clutch doesn’t operate properly if this isn’t done correctly. 3. Ensuring that all bolts which are removed in taking out an old clutch mechanism are re-tightened correctly after its replacement has been fitted also accounts for a great deal of the time - and therefore cost - of replacing a clutch. 4. Clutch replacement costs are also added to by the need for the flywheel to be examined, and if necessary resurfaced or even replaced as part of the process to ensure that the whole system operates smoothly. It’s also always advisable to replace several other parts, as described earlier, when carrying out a clutch replacement - so bearing this in mind, it’s easy to see why the cost of the job can vary so widely, as well as why a mechanic might not be able to provide a totally accurate estimate for the job until the whole mechanism has been taken to pieces and examined. You should be able to get a starting price for fitting a replacement clutch for your car by contacting your local franchised dealer. But of course, there are many other mechanics out there who can do the job, so you shouldn’t automatically accept their quote. Instead, because clutch replacement is a very complex job, and no two mechanics have the same degree of experience and expertise in the field, you’ll find that they’re likely to provide different quotes for the work. It then becomes a question of which mechanic or garage you’re prepared to trust with carrying out the work on your car. But you don’t have to go by your own instinct alone - at MyCarNeedsA.com, our users can choose their preferred garage with the help of reviews provided by our other customers. With such a complex job as replacing your car, van or truck’s clutch, it pays to shop around to find a garage which you can trust, and which meets your other criteria, such as their convenience and ability to do the job when it best suits you. But it could be that time won’t be on your side - which is why you should post the job on MyCarNeedsA.com if you want it to be done both when you need it, and at a price you’re prepared to pay. Getting clutch replacement quotes from MyCarNeedsA.com is simple - and you’re in control of which garage you pick to do the work, and when they carry it out. So sign up to use our service today, and then post details of your clutch repair job for absolutely nothing. Get quotes for clutch repair from service providers near you. What does it mean when your clutch is slipping?